Many children come through the doors of the training hall, some are nervous at first, others are confident, some have special needs. The children train together under their instructors’ guidance, gradually gaining their confidence and overcoming their personal challenges. All the children acknowledge and show respect for their instructors and each other. 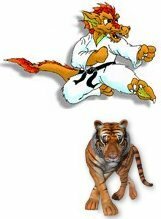 Kenpo is a tremendous outlet for children it allows them to reach their own potential at their own pace, each child is an individual and the Wilkins Self – Defence Kenpo Kids training syllabus is tailored to the individual child’s needs. It gives great pleasure to see the look of joy and pride on the children’s faces when they are presented with strips towards their next belt for various tasks inside and outside of the training hall. The children are taught discipline and self discipline, to be respectful and courteous at all times. Through a structure of respect, children develop the ability to listen, learn and achieve. These skills are often challenging to learn in other areas of their daily lives. Benefits include self-discipline, confidence; coordination and increased strength, balance, agility, poise, safety, and self-defence. Kenpo instruction is an excellent reinforcement of study techniques for school, and indeed, all aspects of life. If your child is energetic, shy, or awkward then Kenpo is probably right for them. Above all it allows them to have Fun! !